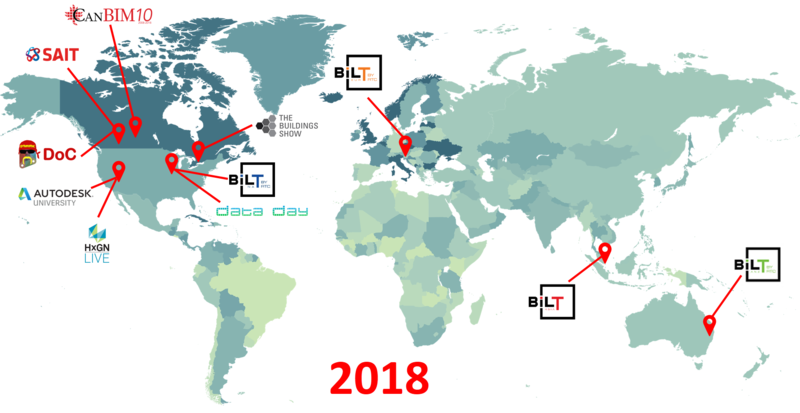 While I was lucky enough to speak at all 4 BILT conferences in 2018, when I was not speaking at BILT I was kept busy with other speaking engagements throughout the year, my busiest speaking year ever! 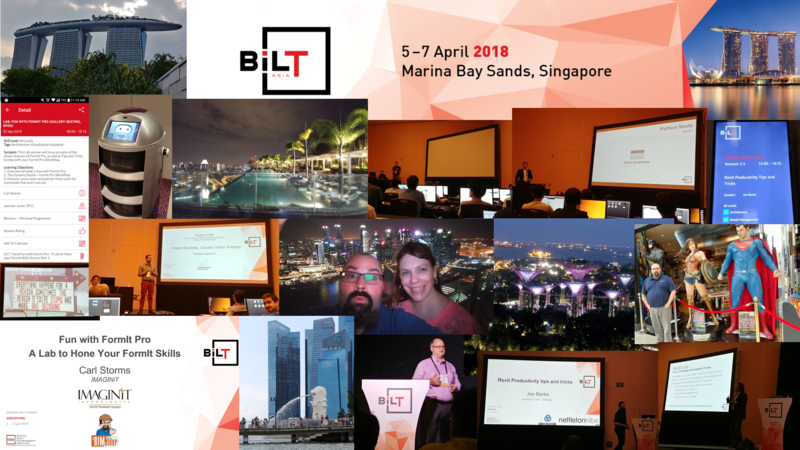 The year started with a trip to Singapore in early April for BILT Asia 2018. This was my first time to Singapore, and also my first time on a plane for 17 hours (SFO to SIN). The conference was held at the Marina Bay Sands Hotel, which was just awesome! I had one session for BILT Asia, it was a lab on FormIt Pro I had also done for AU 2017. The lab went well, and I was honoured to be 6th in the list for Top Ten speakers for BILT Asia 2018. Read more about my BILT Aisa experience HERE, or you can listen about it HERE. You can also get the Handout and Dataset HERE. 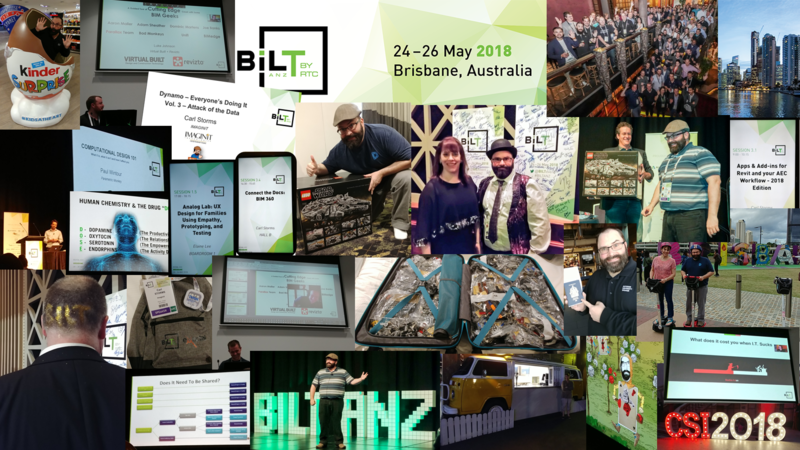 Next on my BILT journey was BILT ANZ 2018 in Brisbane, just 7 weeks after Singapore. This was not my first time to Australia, but it was my first trip to Brisbane and my first BILT ANZ. 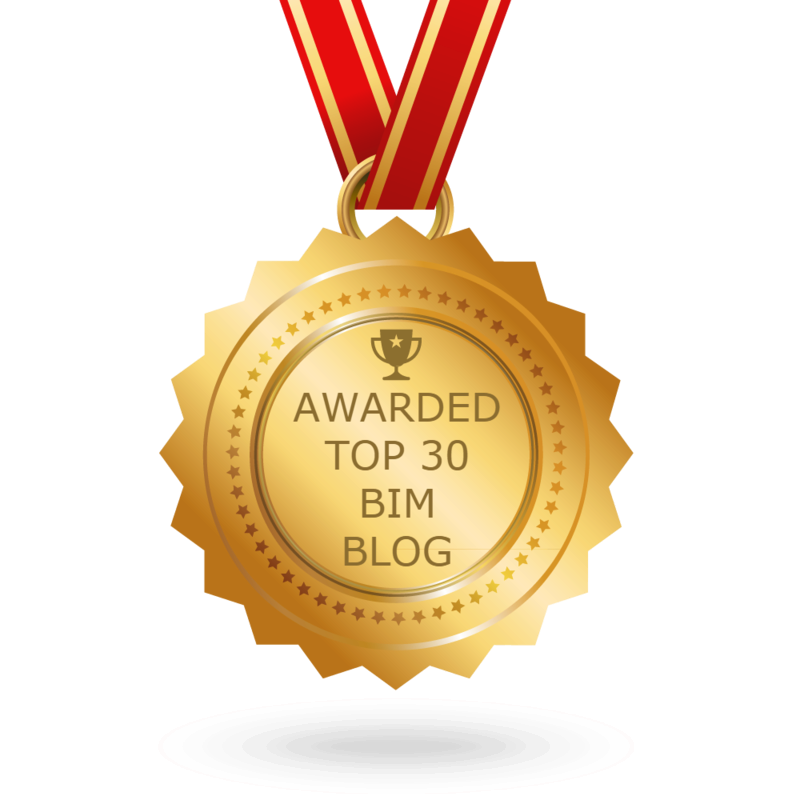 I had 3 sessions, a Dynamo Lab, an Instructional Demo on Apps & Add-ins, and an Industry Talk about all things BIM 360. I also competed in the Vision 20/20 competition, and while I didn’t win, I did get a LOT of Lego for coming in 2nd! I also learned on this trip down under to NOT leave your passport in your hotel safe when you change to another hotel, and another city, just before you fly to the other side of the world!! Read more about my BILT ANZ experience HERE, & HERE or you can listen about it HERE. You can also get the Handouts and Datasets HERE. Now for the shortest trip of my 2018 BILT ride, St Louis for BILT NA 2018. This was another busy event for me with 4 sessions for BILT NA, and another Lab for Data Day happening the day before BILT NA. My Data Day lab was the same Dynamo Lab I did for BILT ANZ. 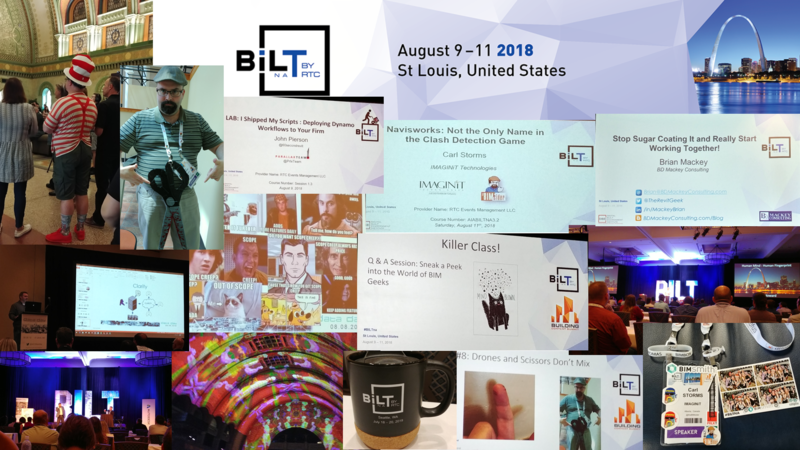 For BILT NA I had an industry Talk about IoT and sensors, I was part of a 10 person BIM All-star panel, I did a Roundtable about broken BIM, and finished it off with an Instructional demo about clash detection options. I was amazed that I made another Top 10 List for BILT 2018, this time being 3rd on the BILT NA 2018 Top 10 List. I would be remiss if I didn’t talk about the awesome Friday night event (which was on Thursday) to the City Museum, a MUST see if you are ever in St. Louis. Listen to more about my BILT NA experience HERE. You can also get the Handouts and Datasets HERE & HERE for Data Day. 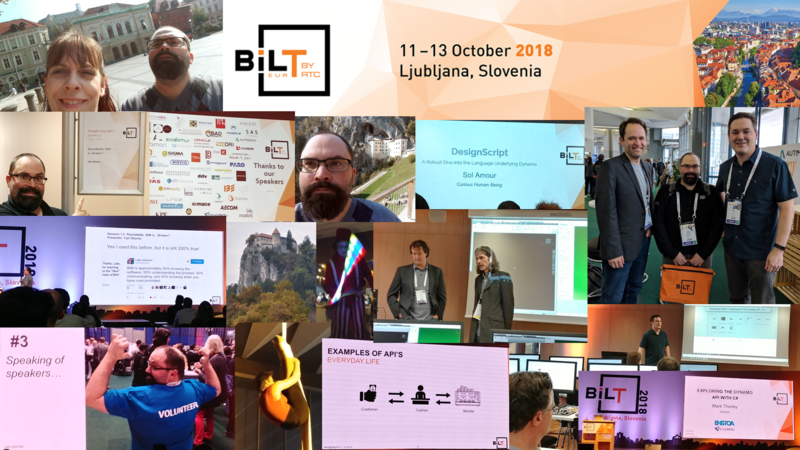 The last stop on my BILT 2018 World Tour was BILT EUR 2018 in Ljubljana Slovenia. 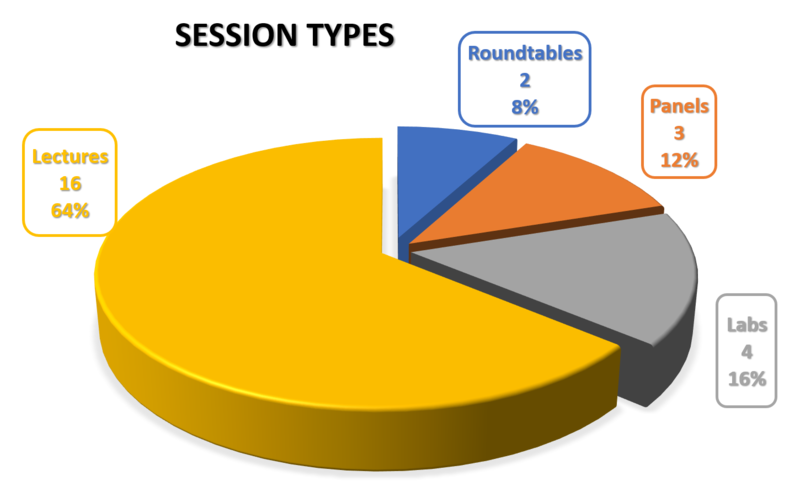 I only had one session for BILT EUR, and it was a roundtable about BIM being broken. My session was the first session of the conference, which meant for the first time since my very first BILT (RTC at the time) event in Vancouver in 2013 I could be an attendee after the first session! The Friday night social event was a “Fun Fair” which was a really cool circus kinda theme, complete with clowns, stilt walkers, acrobats on silks, and a band that did an awesome cover of “Eye of the Tiger” with a violin and accordion! The only downside to this trip was travelling through Charles de Gaulle Airport in Pairs (just don’t do it) on the way there. Missed the connecting flight and our bags took 2 extra days to arrive in Ljubljana, but after that, it was all smooth sailing. 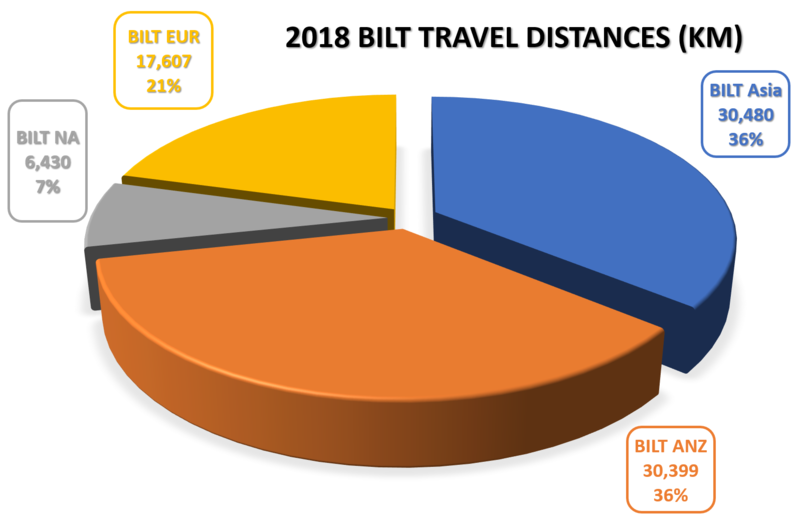 Listen to more about my BILT EUR experience HERE. You can also get the Handout HERE. 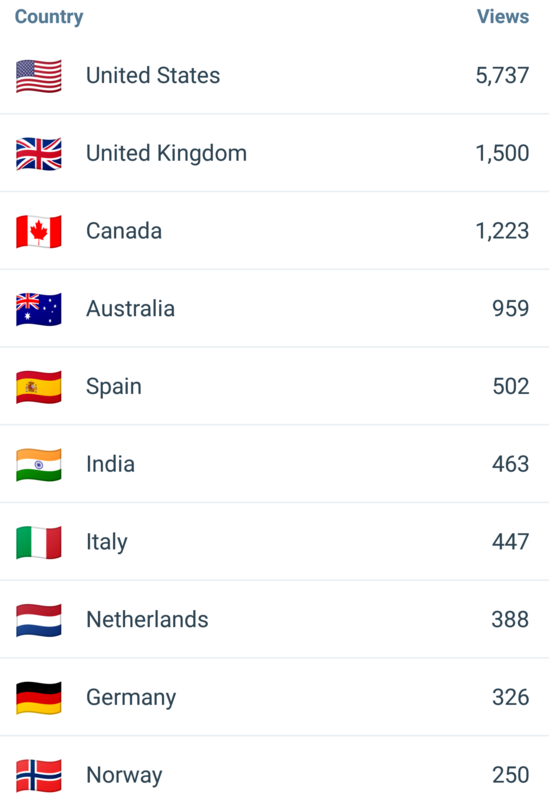 Kilometres Flew: 124,151 that’s just over 3 times around the world! Podcast Quest Appearances: 1, Episode 013 of The Simplex Complex Podcast AEC Design Tech Edition. 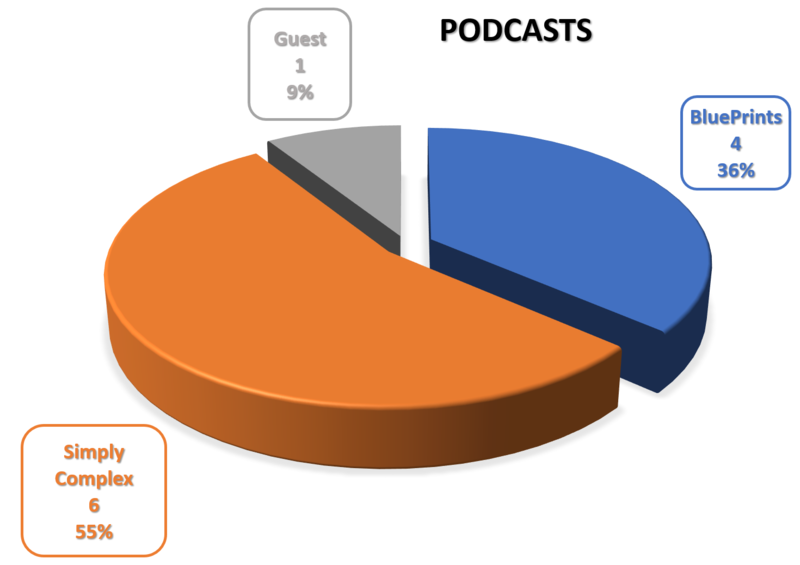 A complete list of all my Podcast activity can be found HERE. Next postThe Podcast Roundup – Episode 054 – Jan. 6th – Jan. 12th, 2019.